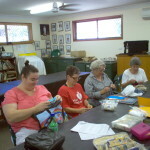 Stitchery - Ettalong Beach Arts & Craft Centre Inc.Ettalong Beach Arts & Craft Centre Inc.
For those ready to try something a bit different, members of the Arts & Craft Centre are inviting sewers, knitters, crocheters and embroidery lovers to join the Stitchery Social Session on Thursdays. The cost is $5 per session to cover running costs plus the annual membership fee which allows you access to other available classes. 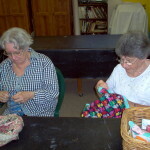 Students from our other classes are more than welcome to come along (no beginners please). 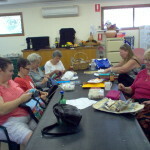 This is a great opportunity for like minded people to pursue their favourite craft in a social setting, sharing ideas and personal techniques. 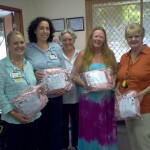 Stitchery members presenting drainage bags and pillow for breast cancer patients. 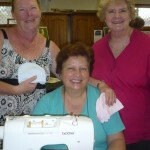 little caps for premature babies in the Neo-Natal ward, Breast Care packages for breast cancer patients (a traditional quilting idea that has been adopted by many groups across Australia), small quilts to be used for covering humidi-cribs and lap quilts donated to local nursing homes. This is quite a challenging program that the stitchery team have undertaken and they look forward to having new members joining them. 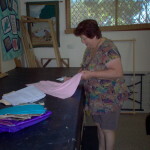 The materials have until now been purchased entirely by the sewers but they will in future be supported by Kariong/Somersby Rotary and Spotlight at West Gosford.